Worst Best Picture: Is Rebecca Better or Worse Than Crash? In “Worst Best Picture” we search every single Best Picture Oscar winner of all time from 1927 to present to uncover the worst of them all. Conventional wisdom says that 2005’s winner Crash is the worst winner in history. We won’t stop until we’ve tested every last one. Read the the first, our review of Crash, here. Posts will be relatively spoiler free, but there may be some details revealed. Today’s installment is the 1940 winner Rebecca. Is it better than Crash? Rebecca, Alfred Hitchcok’s sole win for Best Picture, is mostly about what you don’t see. The story starts with a young woman (Joan Fontaine, who is not Rebecca, but we’ll get to that) who falls in love with a rich aristocrat named Maxim de Winter (Laurence Olivier). Maxim has recently lost his wife Rebecca and is deeply intrigued by the naive woman. They’re an unlikely pair, and the whole thing feels just a bit odd. There is virtually no courtship and they decide to marry right away. If that troubles you, well, that’s probably for the best. Upon returning to Maxim’s absurd estate of Manderley, it becomes clear that Maxim’s life is not quite ready for a new wife. The house staff still feels a kind of deep bond with Maxim’s late wife, and even the moments of kindness they show his new one are more awkward than they are anything else. It’s difficult to write about this because “Rebecca” is dead at the start and Joan Fontaine’s character is never named. She’s the most prominent character, but she’s never named in a nod to how much Rebecca, a dead woman, controls her new life. She can’t even be “Mrs. de Winter,” as she soon learns, because Rebecca is that, forever. It would be enough if the movie were about the struggles to replace a ghost, but it wouldn’t be Hitchcock. The first act of Rebecca touches on that topic, though, and it’s fascinating to watch the young woman walk around an enormous mansion and try to figure out how to be someone she’s never met. She’s too young to be married, even for the time period, and she’s certainly too young in “ways of the world.” It’s heavily suggested that she doesn’t know what to do, in more ways than one, and Maxim clearly got remarried to try to fix his public image as much as he did to try to get over his first wife. The film gets complicated as some truths about Rebecca start to come out, and I won’t spoil all that. You’ve either read the source material of Daphne du Maurier’s novel or you want to keep this one exciting for yourself, either way there’s no reason to reveal the surprise. It’s genuinely not what you’re expecting, though. For as certain as I was about what the central struggle of Rebecca would be… nope. That much is worth your time, alone. The strangest thing about Rebecca might be that it’s Hitchcock’s only win. Four of his films were nominated for Best Picture and he was nominated for Best Director five times, but none of those nine instances earned him a win. 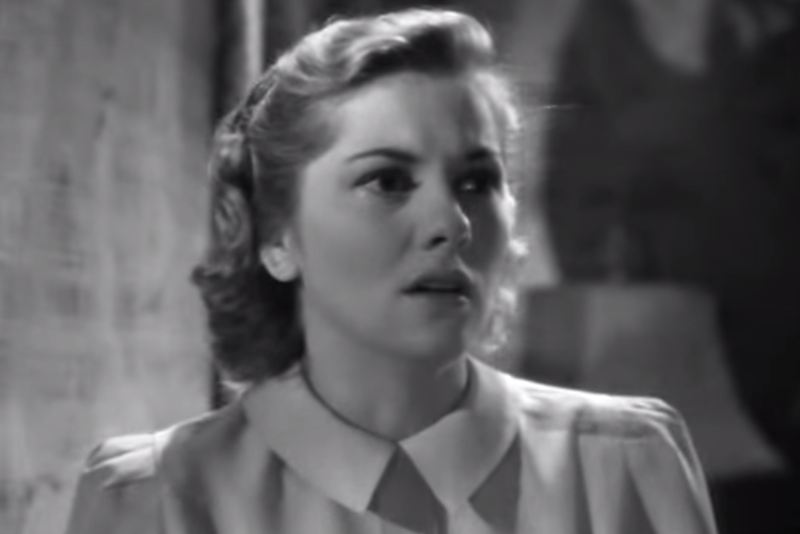 Rebecca is the sole Academy Award to Hitchcock’s name, and at that time they still gave Best Picture Oscars to the producer. Realizations like that make the Best Picture list problematic as a great history of film, because it is possible to complete the list to date and see only one Hitchcock movie. No list is ever going to be perfect, but my nomination for best Hitchcock movie, Strangers on a Train, would have competed with the airy musical An American in Paris. What may be worse, An American in Paris also beat A Streetcar Named Desire that year, and that’s a travesty. The Best Part: The supporting cast! George Sanders, who you will recognize from All About Eve, attempts to blackmail a major character. Even with limited screen time, Sanders is remarkable. He plays the “snotty, sneaky aristocrat” type better than anyone, to the degree that you could make a case that he’s a reincarnation of his All About Eve role. Don’t write than fanfic. Judith Anderson also deserves note for her role as Mrs. Danvers, the housekeeper that will never accept a new Mrs. de Winter. The Worst Part: It’s honestly difficult to find something for this spot, sometimes. For Rebecca the closest I can come is that some of the staff at Manderley are a little absurd. Other than the terrifying Mrs. Danvers, no one really matters. Not a huge complaint, but a missed chance for some better characters, perhaps. Is It Better or Worse than Crash? If for no other reason than one is a powerful entrance to American cinema for one of the greatest directors of all time and one is a movie where Ludacris talks about wanting coffee with spaghetti, I am going to have to tip this ever-so-slightly in favor of Rebecca. ← Worst Best Picture: Is All the King’s Men Better or Worse Than Crash?